As the Indigenous elderly population continues to grow and increasingly enters long-term care (LTC), it is important to support the cultural needs of these elders. The Ontario CLRI project is guided by an advisory circle (Ontario Caring Advisory Circle) to identify and develop culturally appropriate resources to support Indigenous residents in LTC. Resources are developed and spread with support from partnerships with Indigenous organizations and communities across Ontario and Implementation Advisors with experience in dissemination and implementation, and knowledge of LTC. The project aims to align with the United Nations Declaration on the Rights of Indigenous Peoples (2007) and work to address various Calls to Action from the Truth and Reconciliation Commission of Canada (2015). The Ontario Caring Advisory Circle (OCAC) is comprised of 11 members that have knowledge and expertise in long-term care and Indigenous Culture. Members are a mix of northern and southern regions of Ontario and are direct care providers, administrators, family members and representatives of the Local Health Integration Networks. 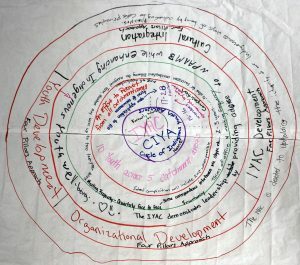 The OCAC meets 10-12 times per year and meetings are guided by an Indigenous facilitator who has vast experience at facilitating sessions within an Indigenous context at federal, provincial, regional and local levels. The mandate of the OCAC is to demonstrate leadership by guiding the identification and development of culturally appropriate resources to support Indigenous residents in long-term care. The Ontario CLRI program is supporting diversity in LTC homes by identifying, developing and spreading education and resources, and working with experts to inform diversity across all CLRI activities.